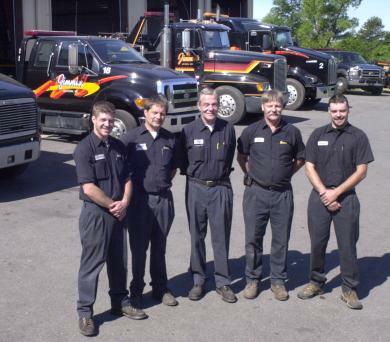 The Jimmie's Wrecker Service Team! Voted Jackson's Favorite for Towing and Repair Since 1959! Pictured are from left to right: Casey Olney (grandson), Rick Olney (Son), William Olney (Owner), Ed Olney (Son), Jason Olney (grandson). William Olney purchased Jimmies in 1972. Williams son's, Rick and Ed, joined the business in 1974. Rick and Ed now are now mangers and the future owners of Jimmie's. Jason and Casey started working for the family in 1993 and 1995 respectively. They each started in tire repair and helpers around the shop and have progressed to, Jason: light and heavy duty driver and Casey: dispatcher and light and heavy duty driver. Their respect has been well deserved because of their "Gitter done!" attitude. Lauri and Sally are deep in the bunker handling the accounting, payroll and pesky salesman. The original building had two mechanics hoists. This building was replaced in 1988 with a larger (108' x 75') building, which now has 3 truck hoists and 4 car hoists. In 1992 Jimmie's went to a Computerized Dispatch Towing System, (CDTS), to insure prompt and accurate service. In the fall of 2003 the Tow Truck Barn was built to house our increasing fleet of Tow Truck Wreckers. We also host our annual employee Dance & Christmas party in the big Tow Truck Barn. It's available For rent. It will hold 500 of your closest cousins, with band and dance floor. Hee Haw! Call for your next MIS - NACAR Family Reunion. Ample Parking! Catering provided by Breakfast Barbs or Lunch / Dinner by West Texas Barbeque Co.